So, the February 26 trade deadline has come and gone, and I've had some time to consider my reaction to some of the more notable moves. I think Ottawa did well in trading Derick Brassard (with Vince Dunn and a third-round pick) to the Penguins in a three-team deal that netted them goalie prospect Filip Gustavsson, defensemen Ian Cole (who was subsequently traded to Columbus for a third-round pick and prospect Nick Moutrey) a first-round pick, and a third-round pick. That's a pretty good haul for someone who is an offense-only sort of player who usually scores at or near the league-average for an NHL forward at 5-on-5 (the black line in the following chart). 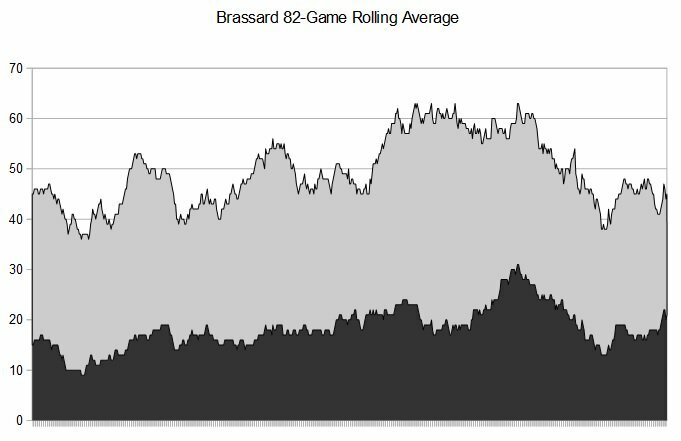 At his peak with the Rangers, Brassard was a 20-goal (in dark), 60-point (total) player who experienced a bit of a fall-of when he joined Ottawa, where he's now more of a 40-point player. So far, he has three points in eight games for Pittsburgh. The Rangers also did pretty well trading Rick Nash to the Bruins for a first-round pick, Ryan Spooner, Matt Beleskey, prospect Ryan Lindgren, and a seventh-round pick. With his current contract Beleskey isn't much of an addition, but Spooner can almost fill in for Nash at this point of his career, and it's always advantageous to pick up a first-round pick and a prospect for a deadline rental. As Joe Fortunato (@JoeFortunatoBSB) pointed out on Twitter, Rangers GM Jeff Gorton turned Nash, Nick Holden, and Michael Grabner into a first, a second, a third, and a seventh round pick, Yegor Rykov, Ryan Lindgren, Ryan Spooner, Matt Beleskey. That's just about as good as it gets. Also, remember that Gorton was the one who got Boston most of their key players when he briefly served as the team's interim GM years ago. A very underrated GM in terms of transactions. 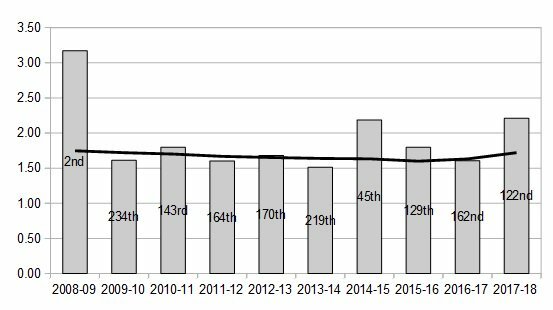 As for Boston, they had 23 games left at the time of Nash's acquisition, and in any 23-game stretch, Nash's career high is 33 points, his low is 7, and his average is 18. So far, Nash has five points in nine games for the Bruins. On an 82-game basis, his peak was 45 goals and 49 assists way back in November 2009, but is currently near his career low of 26 goals, 15 assists, and 41 points. In addition to Nash and Holden, the Bruins added Tommy Wingels, Brian Gionta. In sum, the public response to Boston's moves was pretty luke warm. Winnipeg surprised me by picking up Paul Stastny from the St. Louis Blues, who surprised me by trading him. They're fighting tooth and nail for a playoff spot, and losing Stastny might make the difference. As for the Jets, Stastny has been playing with Laine and Ehlers, and has eight points in seven games. Stastny has been more of a 20-goal, 50-point player for some time, but that's because of the way St. Louis used him. At his (early) peak, he had 34 goals, 63 assists, and 97 points by age 22. Imagine the player he could have been if he had been deployed offensively throughout his prime. His upside in Winnipeg is greater than most people realize, and the Jets may now have the best forward corps in the NHL, according to hockey analytics genius Micah Blake McCurdy (@ineffectivemath). On to Evander Kane, who was moved to San Jose, where he has six points in seven games playing with Joe Pavelski. At his peak, Kane is a 40-goal player, and quite recently too. Normally he's been in the 20-goal, 50-point range. For more detail, check out my closer look at Nash in an article for NHL.com. I also looked at the Paul Stastny and Ryan McDonagh deals. It was a pleasure to be part of the NHL's trade deadline coverage again this year. How important are these trade deadline deals anyway? My friend Dom Luszczyszyn (@domluszczyszyn), who is one of the genuinely really good people in hockey analytics, recently completed yet another interesting analysis. 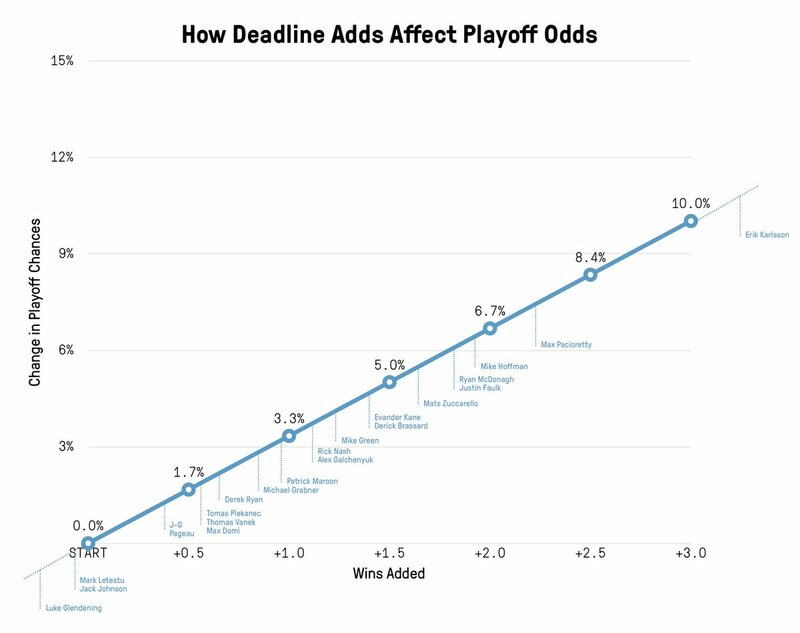 He sought to quantify just how much trade deadline acquisitions can impact a team's playoff chances. 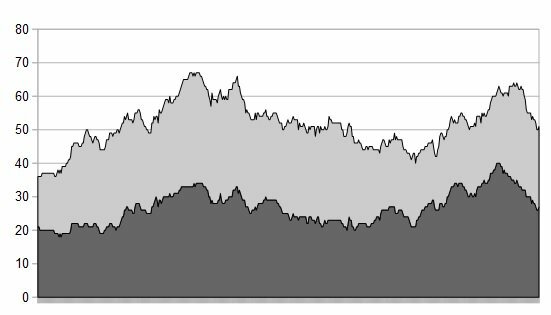 Someone using a different catch-all statistic might place the players at different positions on the horizontal axis, but the key takeaway is how many extra wins it takes to improve a team's chances - very few players move the needle by more than 5%. 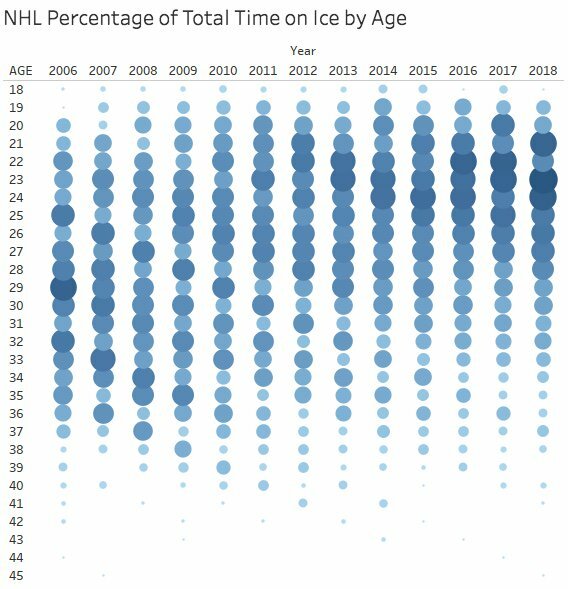 Jason Paul of Wave Intel (@WaveIntel) put together an interesting visualization to demonstrate how the average age of the league has declined since the 2005-06 lockout. I wonder how much of this was caused by the new CBA and its salary cap. After all, entry-level contracts are capped in size, making it quite cost-effective to use young players. 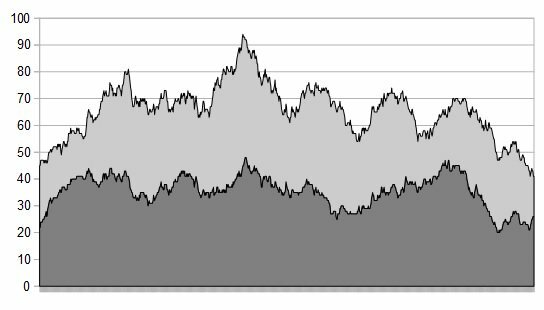 I've been playing around with the idea of awarding the last line change on different grounds, like the manpower situation, the score, the zone of the faceoffs, and so on. Not a lot of people responded to this proposal, and those who did were just as likely to leave things the way they are. It was a lot of fun to watch Ovechkin hit the 600-goal mark. It was an honour to write about it for the NHL's website, including a scenario where we transported Ovechkin back in time to begin his career at the same time as Gretzky, 1979-80. Era adjustments in hockey go at least as far back as The Klein and Reif Hockey Compendium, in 1986 (@jzedklein). We use the same approach as their Ideal Goals stat today, except theirs used the historical average number of goals per game. 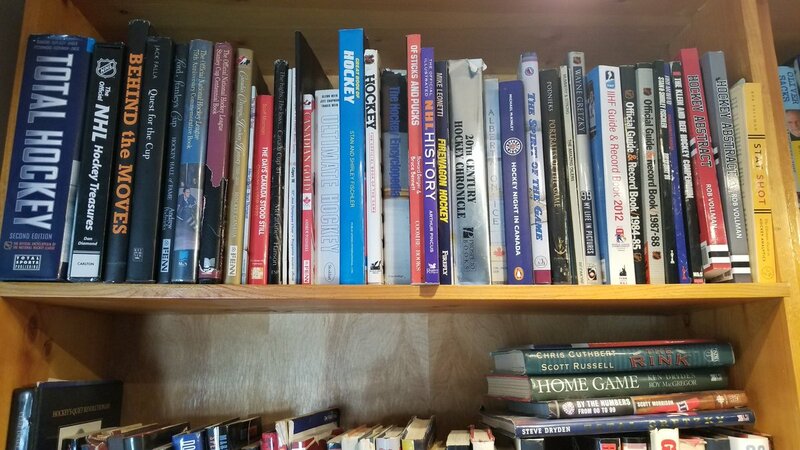 Here's a picture of Bruce McCurdy's hockey book collection (@BruceMcCurdy), where you can see the Compendium on the far right (next to my books). Also check out Stan and Shirley Fischer's Breakaway books, Total Hockey on the far left, and Ultimate Hockey in the middle. A great collection! 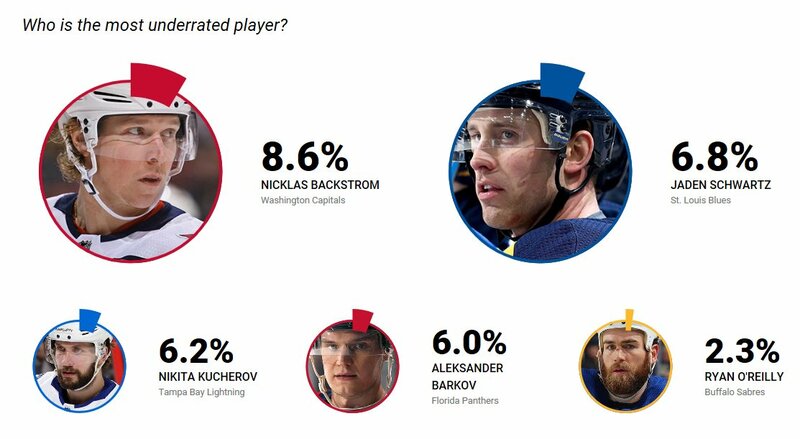 Getting back to Ovechkin, according to my followers, it sounds Patrik Laine is considered the front-runner to join him in that club some day. There was a bit of an online discussion about the value of a hockey analytics department, so I wanted to get a feel for the popular opinion. Turns out, there's no real consensus here. 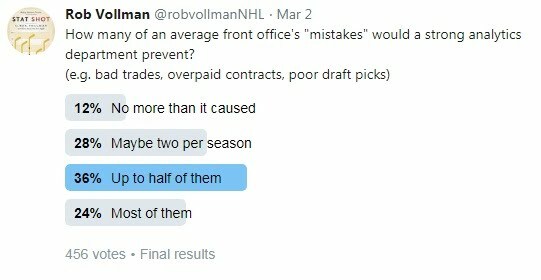 Of the roughly 8 out of 9 fans who feel a department has value, they're pretty evenly divided on just how many mistakes (however you define them) can be prevented with statistical analysis. It might surprise you to learn that I'm at the lower end of those estimates, but even catching a couple per season makes the department worth about 10x what most teams are investing in analytics. Given its growing influence, there's an increasing amount of overlap between hockey analytics and conventional wisdom. For example, the players were polled recently, and it the question on the league's most underrated player served as an example of an area where the eye test and analytics now agree. All five names pop up constantly in studies by the number-crunchers. I'm not sure that was the case 5-10 years ago. March 2-4, there was another excellent hockey analytics conference in Vancouver. If you missed it, it was recorded. (YouTube) By my count, that makes 15 conferences in 9 cities in under 4 years. It's so awesome that this is now a thing, and I'm deeply appreciative of all those who organize and support these events. I noticed that the Golden Knights are trending to have between 11 and 15 players on their roster who hit career highs, even once you set aside those with fewer than 20 points. I searched league history all the way back to 1967 and couldn't find any other team with more than 4 such players. To me, that's probably one of the most surprising stats of the season. I also took a look at each team's penalty differential, and it's no surprise that Carolina is on top, as they always are. They're at +47, followed by Chicago +41, Philly +36, San Jose +26 and Arizona +23. Anaheim is at the bottom by a long shot, -57, followed by Edmonton -36, LA -33, Minnesota -28, Dallas -27, and Washington -24. My friend Stan Nieradka (@smn013) recently tweeted that of the 37 players to play for the Avalanche last season, 14 haven't played this season. That seems like an interesting way to find teams that weren't particularly strong, so I decided to dig deeper. First, I looked at some notably weak teams by hand, and confirmed that the 2014-15 Maple Leafs also had 14 players who didn't appear the following season. However, it seems like the record is 20, by the Ottawa Senators back in 1993-94. No real surprise there. 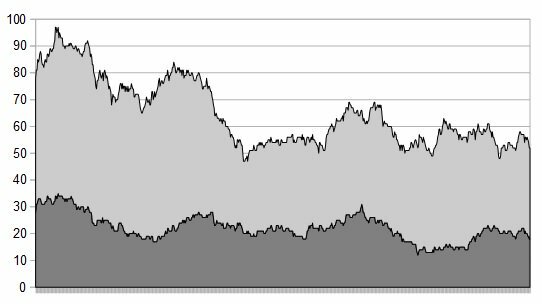 The venerable visualization master Robb Tufts (@robbtuftshockey) has updated his latest work, including player usage charts, team course of the season charts, and team momentum charts. Bookmark all three. Montreal-based statisticians: there's a (bilingual) R conference July 4-6 (website). And, if you're looking for work, there are openings at SPORTLOGiQ (website). Whenever you are based, StatsTrack has a course for manual trackers (website). Please note that I'm not involved or affiliated with any of these conferences or organizations, I am just passing along the information. Finally, there's a new sports analytics newsletter available, called Stathead. I also have a newsletter, but at the moment it is restricted to people who have purchased one of my books. Eventually, I will upgrade my account and open it up to everyone.